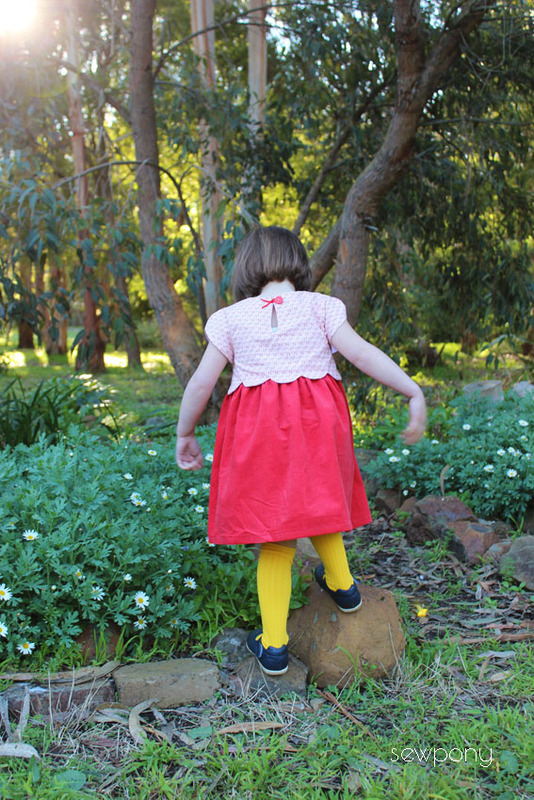 Today I finished a new dress for Emily. Since Isabella and Juliette wear school uniform for most of the day, five days a week, Emily is my most frequent dress wearer! Juliette does insist on wearing a dress every day to school (she can also wear track pants), but she only gets to wear her other dresses on the weekends and sometimes she will wear one after school. For Emily I made a Sullivan dress. 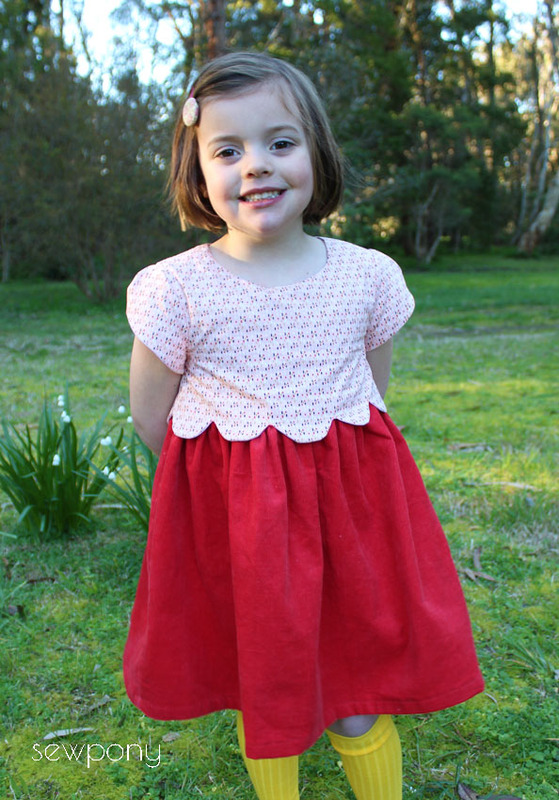 The pattern is new and was created by Abby from Sew Much Ado. This is the first time I have sewn up on of Abby's patterns and I can say that this one is excellent. The instructions are thorough and extremely professional. All the drawings are digital and the pattern gives you the choice of printing or just cutting the skirt piece from measurements. I appreciate this and would always choose to print less when possible! The dress features a sweet scalloped over-layed bodice (also able to make with straight edge instead of scalloped). 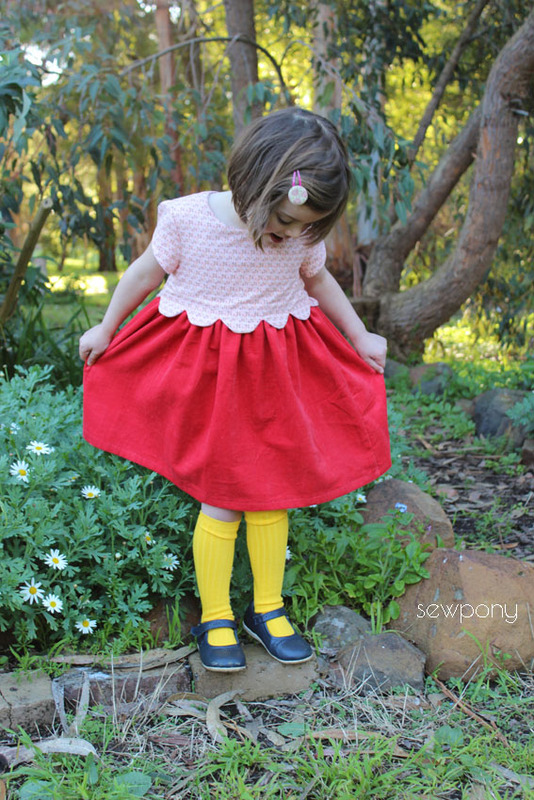 It features a gathered skirt, sweet little sleeves and it closes with a button and loop at the back. I cheated the loop part for the button and instead added a little piece of red ribbon laid in a fish pattern - I thought this would be sweet and it was quicker than making my own loop. You can also make the dress sleeveless or with longer skirt. 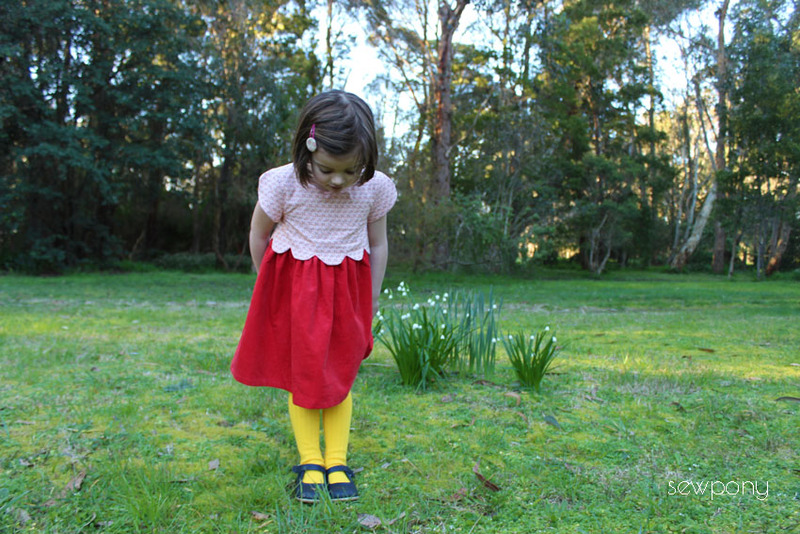 I am not a fan of long skirts on dresses for little girls, so opted for the knee length option. 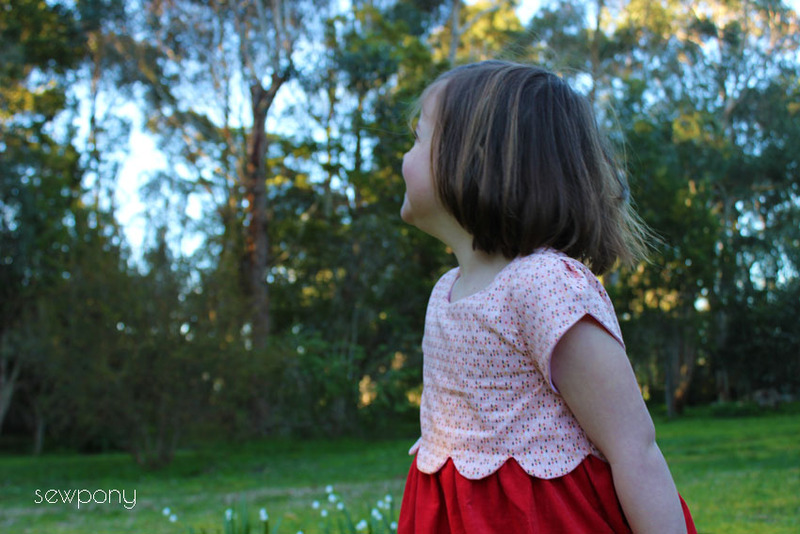 The bodice of this Sullivan dress is made from lovely Soft Cactus fabric - Rhythm in the rain (pink), purchased from Maaidesign. I love Maaidesign and have some lovely new fabric that I am using for something for myself later this month! If you don't know Maaidesign, you need to check out Maaike's LOVELY shop!!!! I only bought a quarter of a metre of the pretty pink print, and luckily this height was just enough to squeeze a size 4 bodice from. The skirt is thrifted soft red corduroy. I used it for a dress for Juliette earlier this year. Emily is also sporting a new haircut! She hates having it brushed and so was often parading a little bird's nest at the back of her head. I think the little bob suits her and it is much easier to manage! The Sullivan dress pattern was given to me for free. I can highly recommend it. Thank you Abby! This is too cute! She is such a sweetie!!! Thank you so much for sewing my pattern! Thank you Abby. Glad you like it! 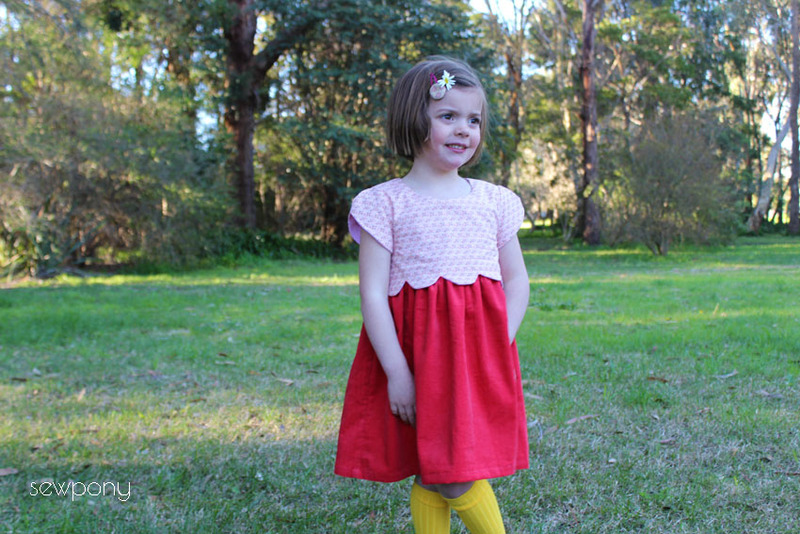 The button loop, the scalloped bodice and her new haircut are just too cute! What a pretty dress it would look great on my grandaughter. I love the scalloped edging too :) Summer here today in western country Victoria too - tomorrow probably winter again in the 'Rat'. Very cute dress! Thank you so much for the lovely comments about MaaiDesign :))) And I very much looking forward to your selfish sewing project! ps: I have just convinced my daughter to have a similar haircut to avoid the daily challenges of brushing her hair! I can't imagine what that must be like with 3 girls!! Glad you like it. I love this fabric!